There are no perfect companies, because there are no perfect people. Let’s face it, despite our best intentions we all have bad days. Moments of inattention or fatigue or distraction when mistakes are made. If your business has employees, you have this multiplied by the number of employees at your business, at least. I say at least, because we haven’t even talked about people who knowingly shortcut processes, are too indifferent or self-absorbed to care about the customer’s experience or who otherwise effectively sabotage a business’s ability to serve its customers to the best of its ability. Nor have we talked about products which fall short of promises or have the rare un-spotted defect. 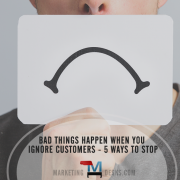 Nor have we talked about the customer who simply got up on the wrong side of the bed and decided to take it out on you and your business, by pointing out every real or imagined flaw they perceive with your business. When you start making lists like that, it’s no wonder we have the occasional unhappy customer – really, it’s surprising that we don’t have more! There’s more than one thing that unhappy customers can teach you, if you’re open to learning. The trick is to figure out what is the most important thing to learn from your unhappiest customers. To find out what is most important, you have to look beyond the surface of the complaint or the customer’s delivery of it, to find out what is really at the heart of the matter. A shortcoming in a product that you sell or in a product that is used in the process of delivering a service. To solve this problem, you may need to replace that product with a better one or work with the manufacturer to eliminate the defect or improve its design or performance. You might need to train staff in different procedures or additional products may need to be added to the service delivery process. A shortcoming in the level of customer care provided at your business. To solve this problem, you may need to retrain or even replace employees who cannot, or will not, fulfill the promises you make to customers about what they can expect to be true every time they do business with you. You should tie job descriptions, salaries, bonuses, incentives and recognition to not only how well people perform responsibilities, but to how they embody the mission and vision of your business and how they contribute to fulfillment of your customer promises. A customer that is not a good fit for your business. Sometimes, even when a customer complaint is legitimate and reveals that a defect in product, service or customer service is present in your business – sometimes even then, what you learn from an experience with an unhappy customer is that they aren’t a good fit for your business. They may need something that your business actually doesn’t provide. They may be demanding to the point that it will never be cost-effective and profitable for your business to retain them. They may have expectations that your business is not equipped to fulfill. It’s ok to admit that a customer is not right for your business, and vice versa. It’s ok to recommend that a customer would be better served by a direct or indirect competitor. Putting the best interests of an unhappy customer first may occasionally result in your recommending that they leave. Putting the best interests of your customers as a whole – and those ideal client types you most want to attract – may mean that while your business is precisely right for them, it is not a good fit for everyone. Merely dealing with a surface issue or placating an unhappy customer is often not what your business really needs. Be willing to learn the most important thing that you can from each and every unhappy customer you have. In the end, identifying the true problem and choosing the right solution will be the path to making your business better for all of your customers, your employees, your profitability, your productivity, and the long-term growth of your business. Elizabeth Kraus is the author of 365 Days of Marketing. 365 Days of Marketing is available on amazon.com in print or digital format. 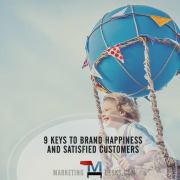 It contains marketing how-to, inspiration and ideas that can help turn unhappy customers into loyal brand advocates for every day of the year. I agree to bill gates sometimes those unhappy person teach you on how can you be patient and how can you handle them without annoying them so much.In Finland they are enhancing most of it specially those call center which always encounter unhappy customer.